I really surprised that many still don’t know that Nigeria’s telecommunications giant, Globacom launched a new data tariff called TGIF which allowed subscribers to enjoy 3GB of data for just N500 during weekends. The Company also added “This is simply designed to meet the expectations of subscribers who download and upload a lot of content during weekends. We have observed that subscribers have the time to do heavy browsing on weekends, hence the TGIF bundle is designed to meet that demand”. TO subscribe for this data offer, from your phone dial *777# and follow ‘data services’, then select the ‘Buy Data’ option on the menu and then pick ‘Night and Weekend Plan’ which is number 7 on the next menu page. 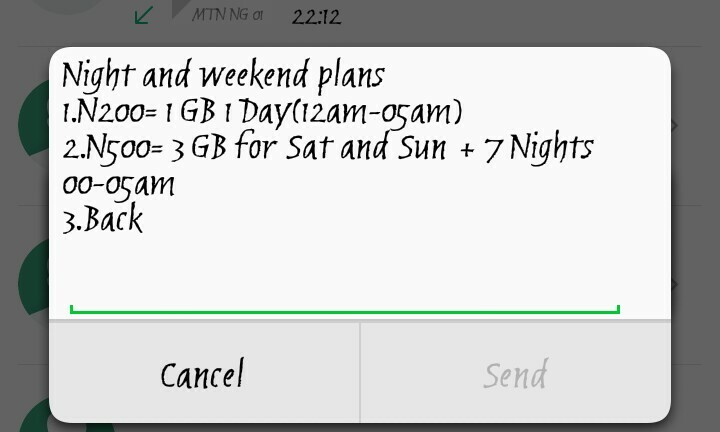 After that, you should pick option 2 on the last menu which reads “N500 = 3GB for Sat and Sun.